What's Mummy Up To ...: Out of the Comfort Zone and Loving It! Out of the Comfort Zone and Loving It! This post is brought to you by Nuffnang and Spotlight. So, I'm not a knitter ... have never been a knitter ... have tried and it just hasn't clicked with me ... crochet any day, but not knitting ... UNTIL NOW! 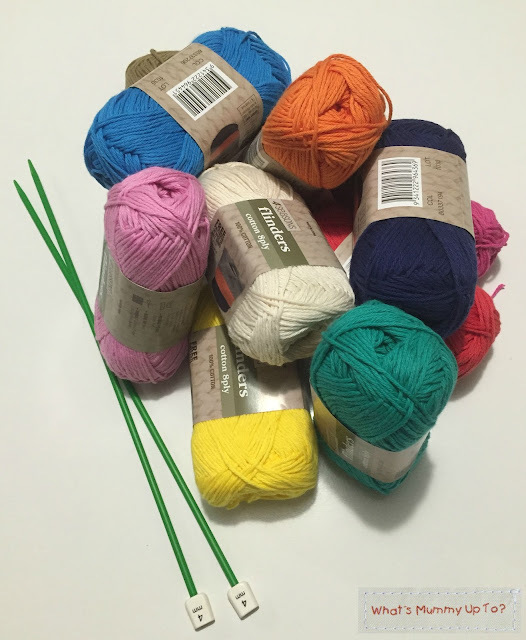 I was asked if I'd like to try out some lovely cotton yarn and some knitting needles from Spotlight, and I was like ... "Yarn, well of course!" And then this lovely package of brightly coloured cotton arrived together with some cool green knitting needles, and I suddenly thought ... "What have I done? ... Knitting!!!" 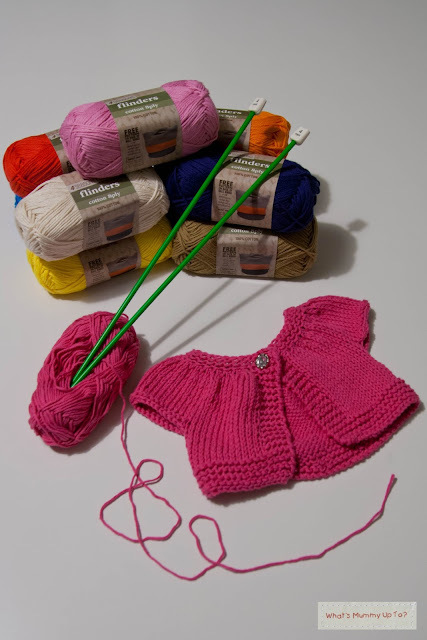 After some deep breathing into a paper-bag, I realised that this would be a great chance to have a go at some knitting... sometimes it's good to step out of the comfort zone after-all, huh! A change is as good as a holiday, and all that ... right! 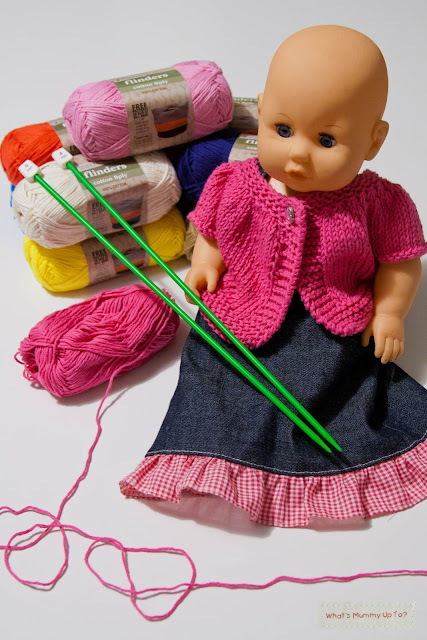 I had to see my Mum (aka ... Knitting Extroadinare) and she suggested having a go at a Dolly-sized Kina. 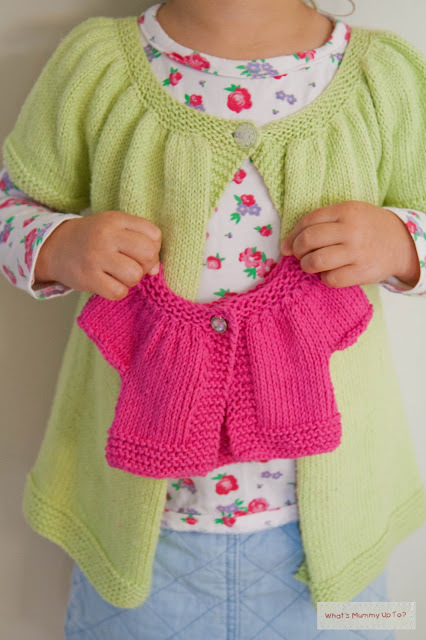 Now a Kina is this gorgeous little short-sleeve cardigan pattern, and one that my Mum has knitted many times after seeing it in blog-land. In fact she's made one for each of my girls, one for me and one for herself, as well as several others including a couple of the dolly-sized ones. Here's Hannah in her lovely green Kina. Anyway, I had a look at the pattern and realised that the dolly-size is a free pattern (with 2 sizes to choose from), it's knitted all in one piece, only uses knit and purl stitches, and seemed like a nice quick project which I was definitely going to need if I was to be successful in knitting something. Just perfect for a beginner. So I got dressed into my Kina too ... you know, for added inspiration in the hope of channelling my inner-Kina... 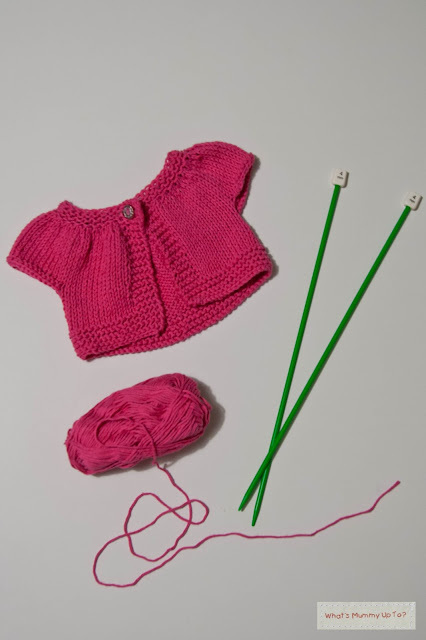 I grabbed this gorgeous fuchsia cotton (available from Spotlight here) along with my funky green knitting needles and cast on the little Kina. Who knew I'd even be able to remember how to cast-on, but I actually managed it. My happy-dance was short-lived though, as I soon got stuck, but after another visit with my Mum for her to help me get my head around the increasing, I was off and running. And after that, this little cardi came together in one evening, complete with a sparkly button from my stash because, well .... SPARKLY! And there you have it ... I'm out of the comfort zone, and loving it ... now I'm even looking for other knitting patterns for using the rest of this yarn ... maybe something in a bigger size next time. So about the yarn... It's called Flinders, and its 100% cotton from Spotlight. This is 8 ply and it's really soft and lovely. I've always preferred the feel of cotton over acrylic or even wool, and these 50 gram balls are no exception. I'm lucky enough to have a Spotlight close to home, and I'm definitely a frequent visitor for pretty much anything crafty that I need ... fabrics, buttons, yarns, and anything else I can find when I'm there (I never just come out with what I went in for ... it's actually a running joke in my house!). But for those of you who can't get there, did you know that Spotlight have a website? ... You can totally order online. 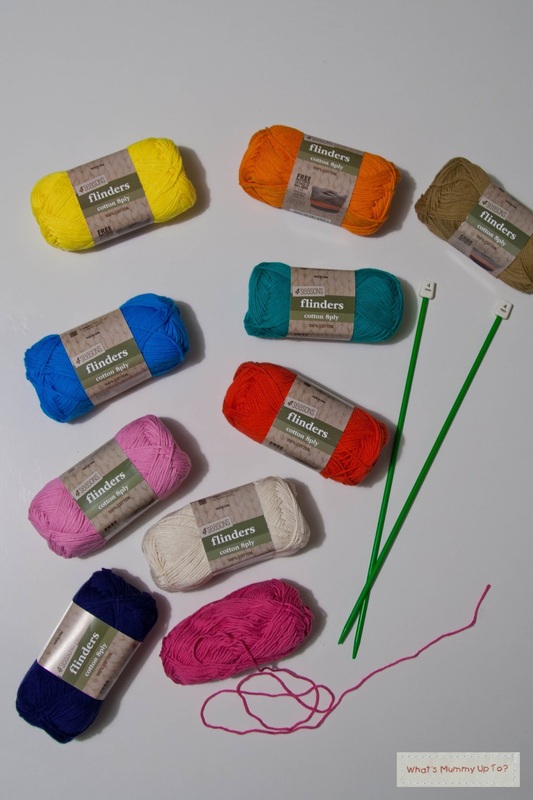 I had a quick look, and these yarns are $3.99 per ball at the moment. Not bad at all for 100% cotton. It knitted up beautifully, with no splicing, and the little Kina is so very soft. I actually think this yarn would be lovely for a crochet (or knitted) throw rug. It's smooth and soft and with the gorgeous colour range, there's sure to be a colour to suit any project. So, step out of your comfort zone and try a new craft ... you won't be sorry, and how lovely to have another craft option to choose from now ... you know, when I'm not crocheting, or sewing or doing anything else I can think of to avoid housework! Oh, and I think Dolly is pretty stoked with her new Kina too, don't you!